Located in southeastern Mexico, Cancun is one of the easternmost points of the country and renowned for its beautiful climate and beaches. The city is one of Mexico's most renowned tourist destinations and, due to its layout in superblocks with walkways and parks, highly bike-friendly. Great beaches, savory Mexican food, interesting Mayan ruins and a great nightlife make this place an absolute dream destination. All these compel tourists to book cheap flights to Cancun for a memorable holiday. 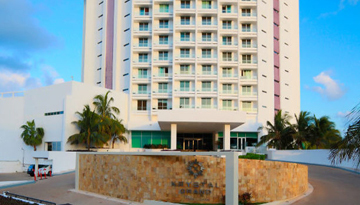 The name Cancún originates from the Mayan "kaankun", which translates to "nest of snakes". However, despite that, the city is no nest of snakes! It still demonstrates the strong and interesting Mayan influence in the region, which you will come to appreciate each time you take a trip outside of the city. You basically get the best of a modern travel destination, in combination with a strong culture and tradition. Taking a flight to Cancun between February and April will be the right thing to do. The weather is warm and sunny letting you enjoy the Mexican town the way you want to. So, grab some discounted rates and let the party begin. Starting in 1974, Cancún was transformed from a fisherman's Island into a tourist destination that won the WTO's Best of the Best award. Ever since, the city has attracted people from all over Mexico, particularly Yucatán, the Americas and Europe. With direct and fast connections to ChichénItzá and Mérida, it is the perfect place to combine hanging at the beach with trips to the famous Mayan pyramids and cities with a Spanish colonial flair. 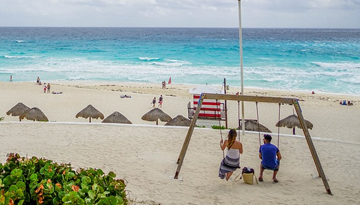 A cheap flight to Cancun will let you indulge in tacos or a typical Mexican horchata while enjoying the ocean view from your balcony, because one thing is sure: in Cancún, everything has an ocean view or at least a view on the lagoon. Mayan as well as Mexican art and culture are very colorful, vibrant and rich. The Casa de Cultura Art Center and the Teatro de Cancún feature regular art's exhibits, dance performances, concerts and plays. For those who love history, we highly recommend a visit to the Museo Maya with more than 350 archaeological artefacts. Find a cheaper flight to Cancun to immerse yourself in the best of what this attention-grabbing Mexican town has in store for you. And, if you prefer modern culture, there's the yearly Riviera Maya Jazz Festival in November. Also, the Cirque du Soleil Riviera Maya offers a spectacular dining experience to an incredible show about a teenager lost in the jungle inside a magical world. Book in advance, as this event is one of the highlights in Cancún! Many tourists take a flight to Cancun from London to let themselves loose in some fun under the sun. Are you an adrenaline junkie always out for some adventure? Compare flight tickets to Cancun for a swim with whale sharks. Between June and September, taking a glimpse of the majestic creatures is an experience in its own. 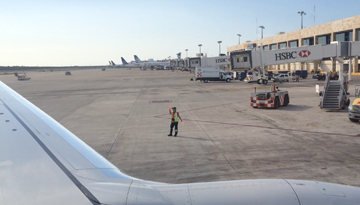 Cancún is served by a flight to Cancun landing at the Cancún International airport, which is located about 20km from the hotel zone. Due to the city having been conceived for tourism, you can easily get around by bus or even bike. Also, you can book tours to the most famous Mexican tourist attractions or catch one of the direct buses headed into their direction. Thomas Cook offering an winter flight sale - £229.99 incl. return flight to Cancun from Europe cities. Get Special Offer - Double Standard Ocean rooms just for £207 with 4 star stay. Fly from London Gatwick - Cancun & Stay for 7 nights with 5 star accommodation. Room only.